CSSWE’s REPTile data is featured in a Nature paper written by Baker et al., which has been recently accepted to the journal. 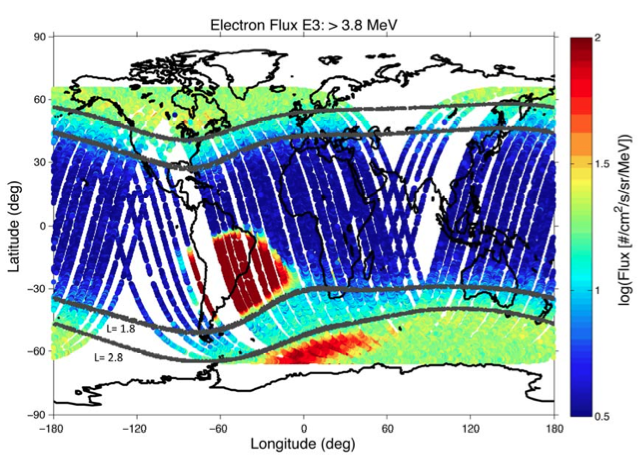 The paper, titled “Nearly Impenetrable Barrier to Inward Ultra-relativistic Magnetospheric Electron Transport”, shows an impenetrable barrier to ultra-relativistic electrons in the Van Allen radiation belts. The paper uses REPTile data to supplement REPT data, an instrument onboard NASA’s Van Allen Probes mission, for >2 MeV electrons. The barrier can be seen in the REPTile data as well, which causes the gap in electron flux between L=1.8 and L=2.8.